At Virtuous Bread, we believe our bread classes and courses are the best you can find and this is because we truly care about our students. Our bread classes and bread courses are small and intimate. We care about you, and work to create learning environments in which you feel comfortable and at home. Prepare to get sticky and floury because our classes are truly hands on! You will mix and knead the dough, shape it and take it home with you at the end of the day. 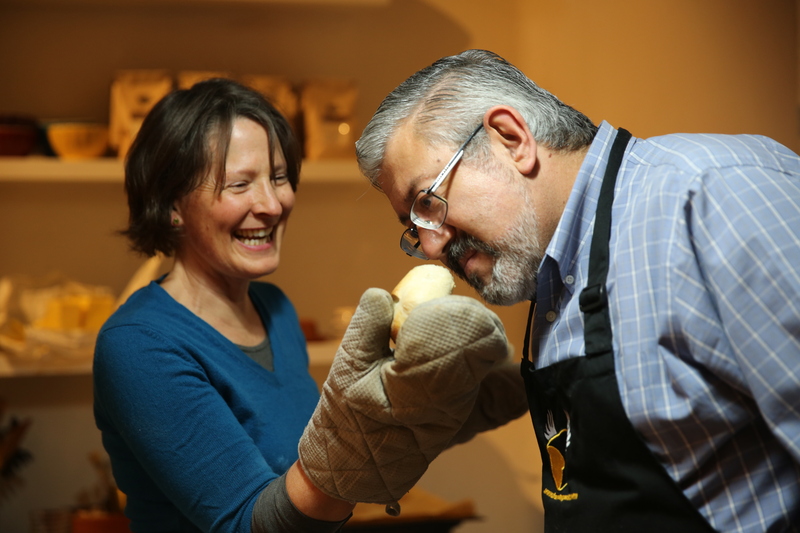 While the dough rises and bakes, there is plenty of time to ask questions and delve into the process and ingredients for baking bread - or simply socialise with a group of lovely people. Our classes are timed so that you know you are baking "real bread" - bread that has fermented properly so it not only looks gorgeous and is more flavourful, it is also easier to digest and, therefore, healthier. Finally, classes include teas, coffees, light meals and snacks! In fact, make sure you come hungry. "Lucie, I just wanted to say thank you so much for today. It was an absolute joy, I can't believe you taught us so much, provide a lovely lunch and we came home with all our bread. I can't wait to give it a try at home, feeling so much more confident to give it a go! Sharyn and I will definitely be back for the course on Italian breads." "When I first wanted to try baking sourdough bread, I looked it up on the internet and down loaded a 25 page document which was the first in a series of documents about how to bake sourdough bread. It was completely unintelligible and confused and intimidated me. I had done the Bread Angels course with Jane and I just knew she would be able to teach me how to bake sourdough bread in a way I would understand. I was right. She made it completely easy and worked with the class to help us all understand that baking with sourdough is simple and straightforward." "I took a sourdough bread class with Juli. The class was in her home - a beautiful location in west London and easy to get to. I loved the fact that it was at her home - there were only four of us and being a complete beginner, it was useful to see how the baking process works at home, not in a professional bakery. Juli had plenty of time to work with us individually. We tried different flours, ingredients, and techniques and we baked loads of beautiful different kinds of bread. Juli was happy to share her knowledge and experience and there was time to answer all our questions. I am now a much more confident baker and (sorry supermarkets) have only eaten home made bread since." "Liz's Basic Bread course showed me that making delicious bread was not just simple but also highly enjoyable - a revelation! The learning is enhanced by the small group size and Liz's hugely encouraging tuition. The shared, yummy lunch was a great bonus and really reflects the whole approach that is Bread Angels. From Liz's very friendly welcome at the start to going home with the warm loaves I had made, it was a delightful experience." "My girlfriend and I really enjoyed our Sunday session with Alex Vaughan. As someone who has done some baking before, it was really useful for me to be able to troubleshoot with her some of the problems I've encountered, and see a practical hands-on demonstration of how good baking is actually done. She was very friendly and welcoming, and very knowledgeable in answering the many questions we had. We certainly learnt a lot, and I look forward to being able to apply her tips to my own baking. And of course, very importantly, we came away with some amazing breads and the recipes to make them too! All in all, a very enjoyable course." "Iain, just a quick thanks for today. Everyone here has enjoyed feasting on bread tonight, and I cant quite believe I made it all. I'm also excited about it running out so that I can get my pinny back on." "I signed up to do this course as I wanted to know how to make real bread and I certainly came away feeling that I had achieved that and much more. Sara is so good at teaching you and giving you confidence to have a go at making things. A lovely relaxed atmosphere. I loved every single minute of the day and would certainly encourage others to go on her courses."